Laboratory testing is a valuable tool that is used in a wide variety of diagnostics in veterinary medicine. At SRVC, we continually strive to offer the highest quality medicine and services to our customers and their pets. This is why we are proud to offer our in-house diagnostic laboratory services as an additional means of providing excellent and convenient care to our patients. Over the years of caring for your pets, you find that there are many important diagnostic tests that can only be performed by outside laboratories. In other instances, though, some tests can be performed at our in-house veterinary diagnostic lab. 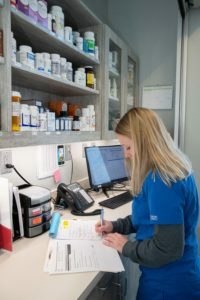 Having access to accurate test results obtained using our in-house veterinary laboratory can provide our veterinary care team with the information they need to better serve your pets’ needs by expanding the testing options available to all our patients. SRVC offers veterinary diagnostic lab testing in Little Rock to provide another layer of services to our valued clients and their pets. When it comes to accurately diagnosing your pet, time is often of the essence. By providing veterinary diagnostics tools we can provide you with the answers you have been anxiously waiting. These answers can facilitate better management of your pet’s care and condition. Here at SRVC, we are eager to answer any questions you might have about the diagnostic testing services we offer. Be sure to ask one of our skilled professionals how our laboratory services can benefit your pet the next time you are in our office. Alternatively, you can also call us or contact us using the form on our website and ask your questions at that time.